Obi-scarf(obi-age) is a scarf length rectangle thin silk. A small pillow would be wrapped at the center with the scarf. 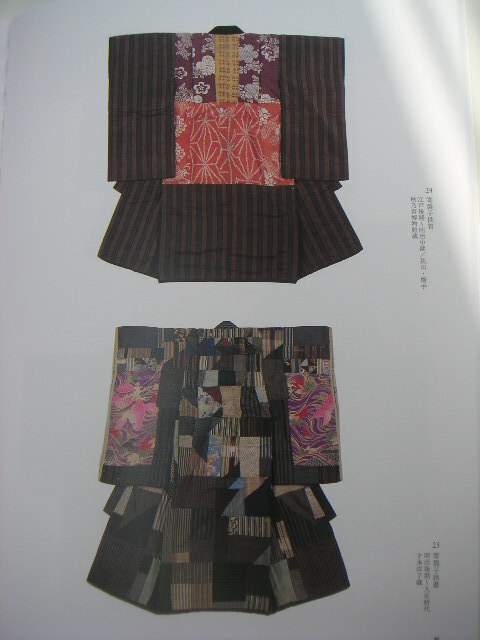 It makes a swell inside the taiko at the back like a bustle and both ends of obi-age are tied in the front and plunged into the gap at the top of obi. 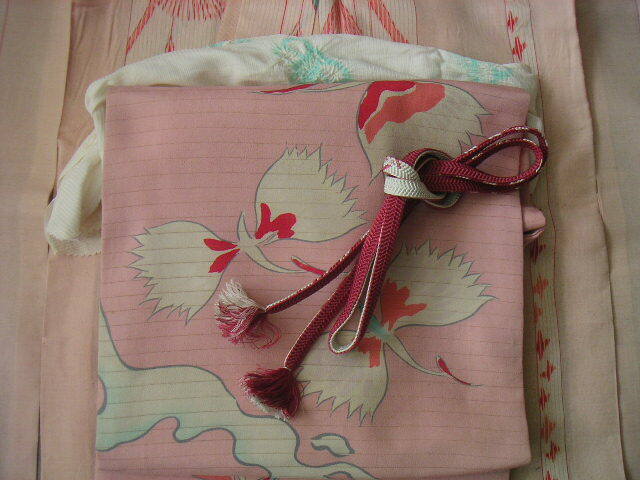 Obi-code is tied at the center of obi. It is chosen to accent its color. 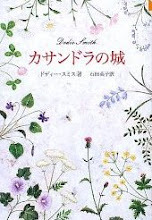 I have seen the DVD of "The Memoirs of a Geisha" recently. 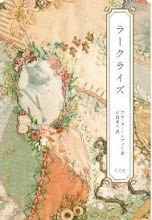 I couldn't concentlate the story because of very strange mixture of Japanese and Chinese culture on screen. 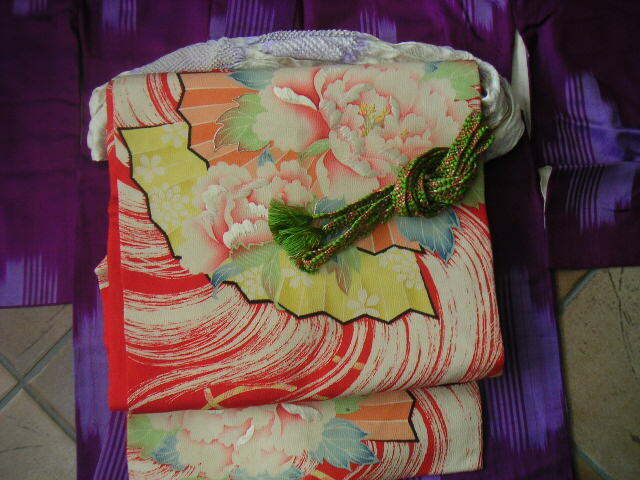 Why they liked the mixture better than pure and real Japanese kimono style? I have seen many pseudo-kimonos for souvenior in Narita airport shops, which are far different from our real kimonos. Why tourists like them better than real ones? Do you have any opinion? 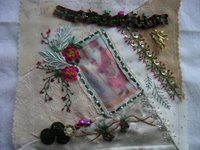 Sharon B's online class started last Wednesday. It's 2nd time for me. I was thinking long time what to do and again took my UFO. 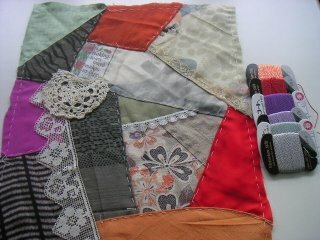 I have pieced up a rectangle block this time. I had made four fan blocks after last class but I don't remember what I was doing with these ones. 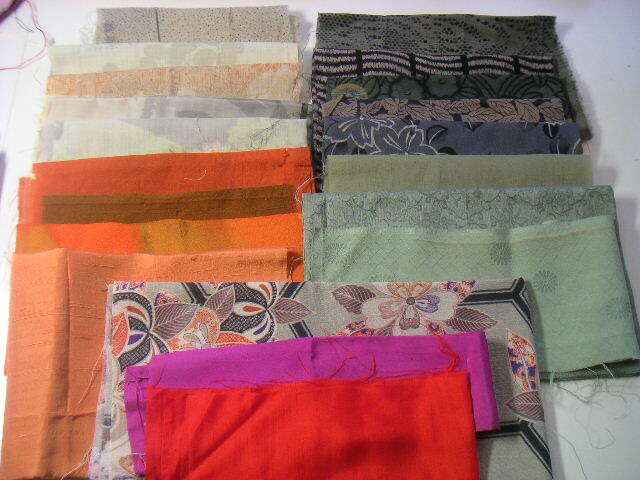 I had collected matching fabrics too. My colors choice of CQ always reflects my mood rather than my favorite. 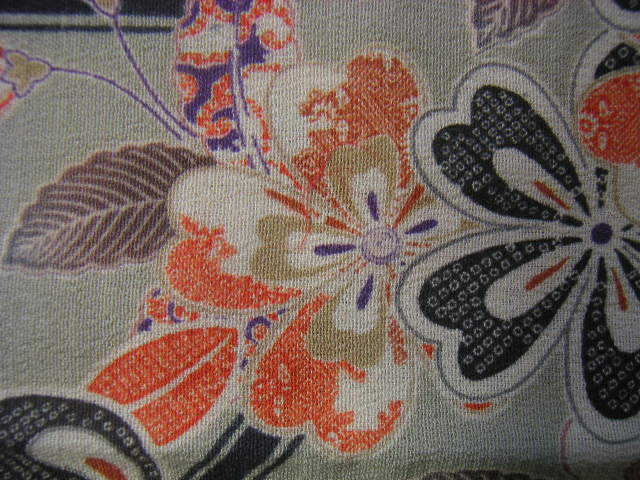 But I found a Japanese patterned fabric exactly matching the color scheme I chose. 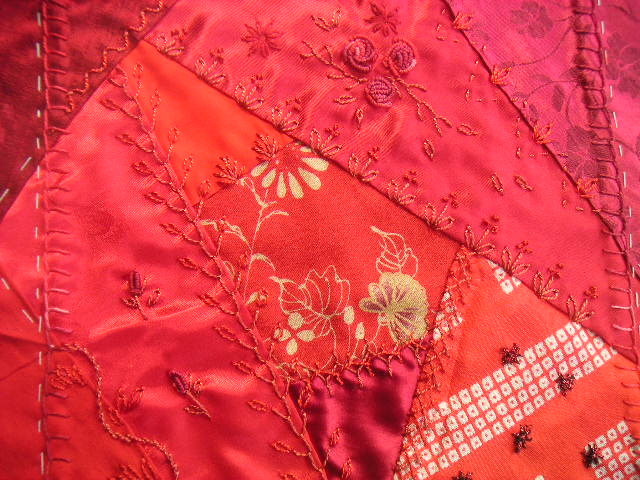 It's the color-different one from the fabric I used for the last class. 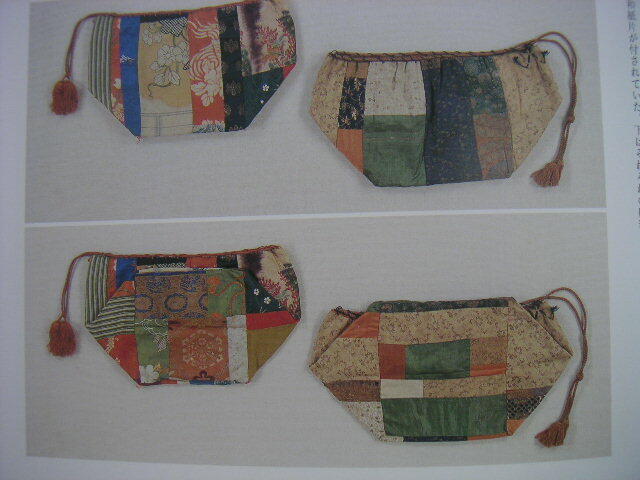 They are designed by Japanese quilter Yoshiko Katagiri. Her color choice must have inspired me then. 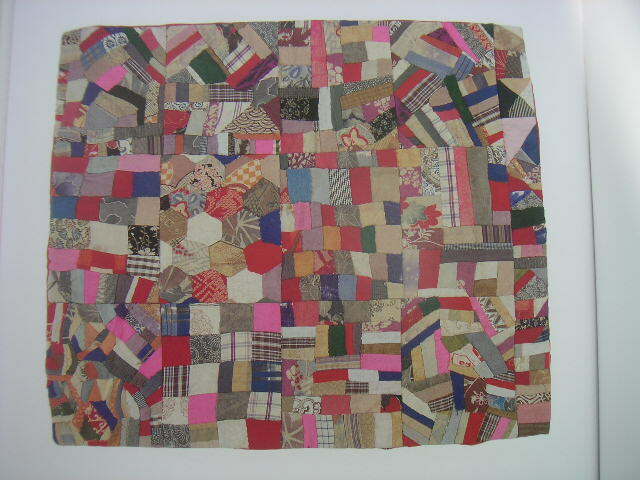 Therefore this block would be a centerpiece and the fan blocks put at the corners. 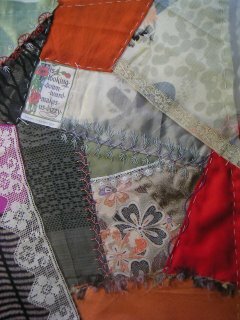 the Quilts for Leukaemia, which Clare Worthy from France organises. 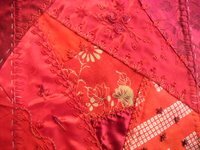 She sent me a comment on this blog a few weeks ago. 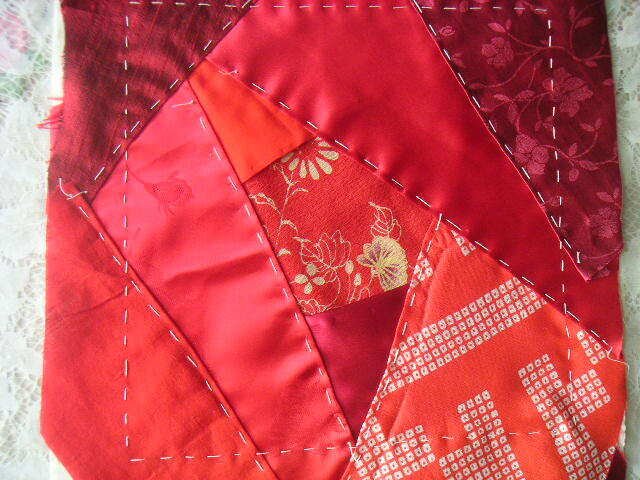 A block must be red & white and 8.5" square. I thought my block should be not so heavy because other blocks must be sane ones. If one block is too heavy, it may destroy the whole balance. But Clare wanted beaded block when I asked. 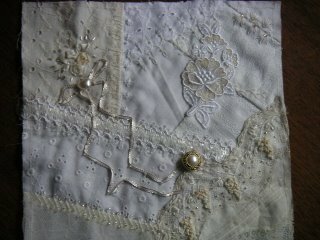 Therefore I added beads and made the block heavier than before. And I will send this block too. Very very long ago I sew up many small log cabin blocks with red and white prints. 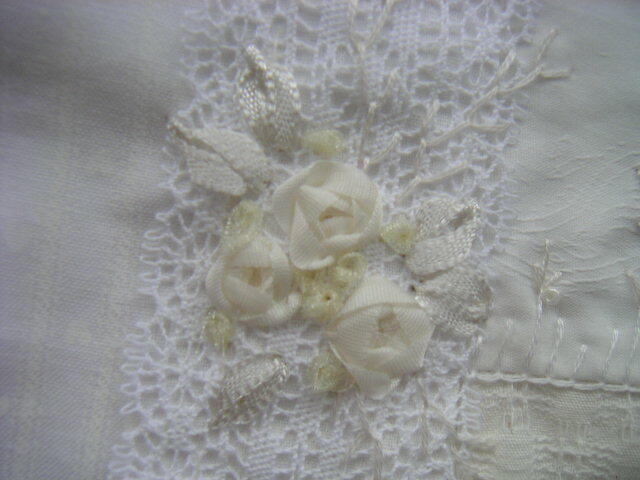 I remembered that and seeked them to make this block. I can do logcabin and nine patches. 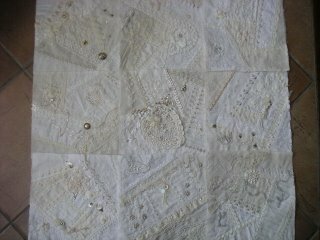 A few years ago a Japanese quilter Junko Miyazaki's book inspired me to make a white on white crazyquilt.Then I pieced 9 blocks, finished one and worked two. 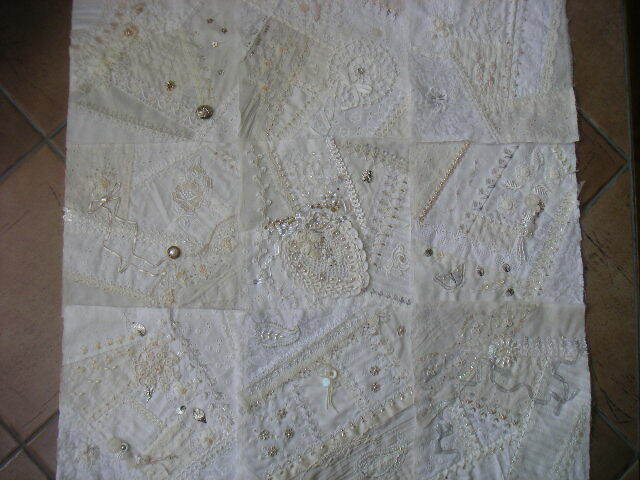 But after that my white quilt became a UFO because of my changable mood. I started it again, following Sharon B's "100 details in 100 days" in this June. 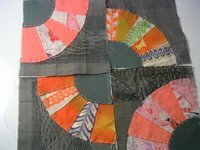 Though I have been very slow I have finished all the blocks. I embroidered one of the Helen Stevens's butterflies with DMC rayon. 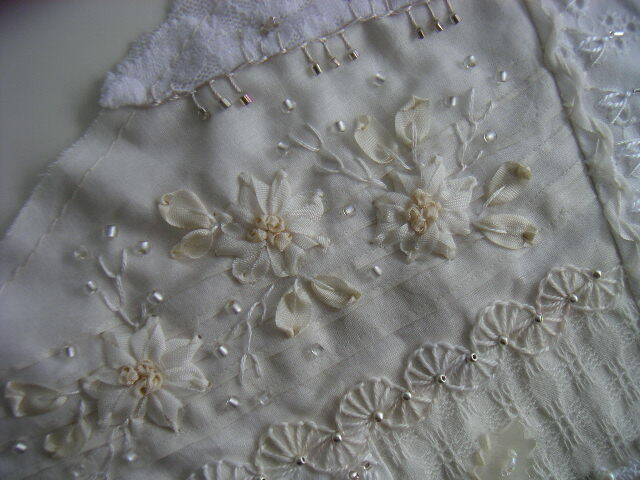 This old lace had been used for a small giri's summer dress. 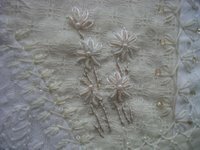 I put lace motifs for flowers and leaves, and stitched and beaded. Three different texture ribbons are used. 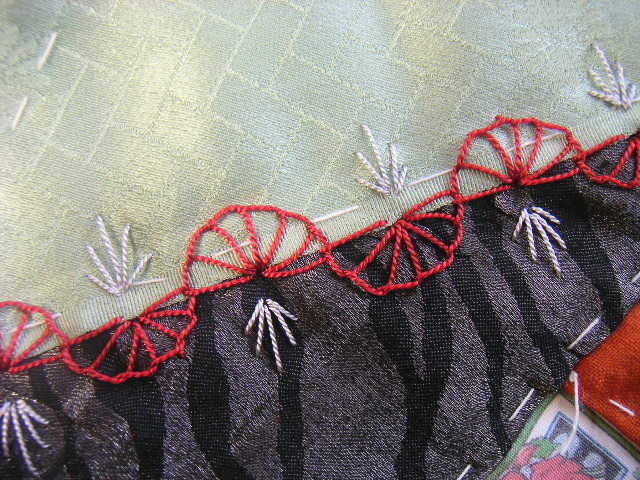 The ribbon for leaves is 7mm wide. 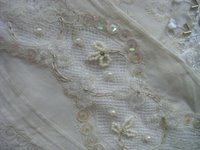 Others 4mm. 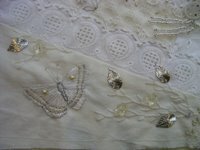 I had felt to be very poor at bullion stitches. 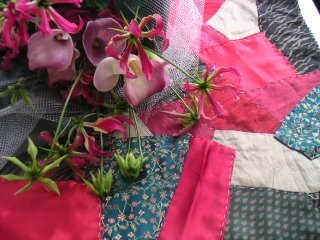 The milliner needle from Pat Winter helped me to do the stitch well. The thread was from Emiko. 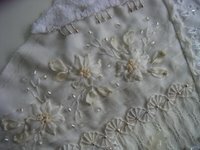 I am considering how to sew up these blocks. If you are interested in the close ups of each block or each seam, they are on my flickr albumn. 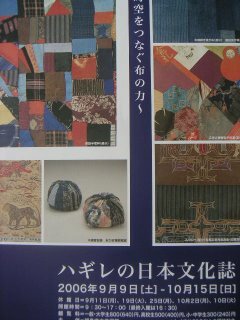 Yesterday I went to see the very interesting exhibition of old Japanese patchworks with friends. 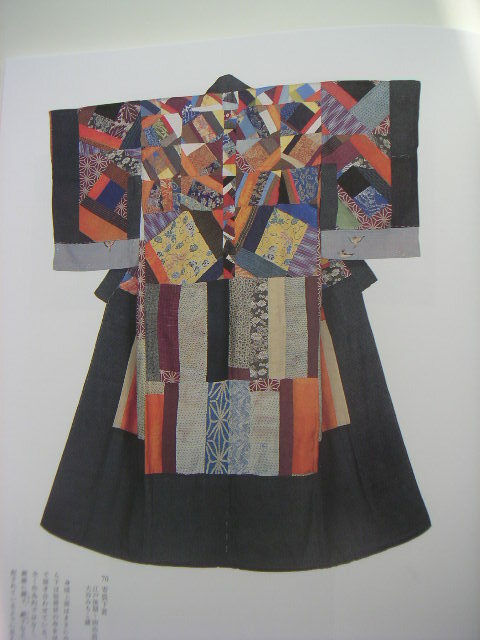 There were lots of patchworked kimonos, most of which were worn as Juban or underwearing kimono in 19th century. 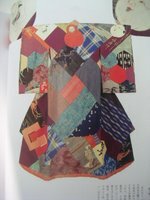 I will show you some photos out of the illustrated book. Both are small children's juban. 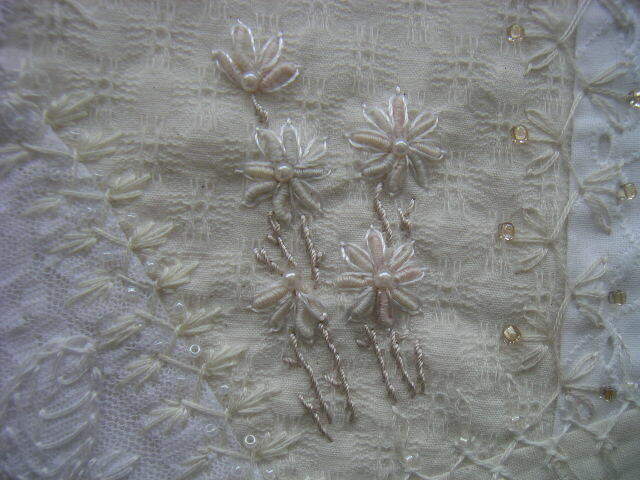 You can see the back bodice is crazy patchworked. This is a juban for a child, too. There are two different masks put on both shoulders' part. 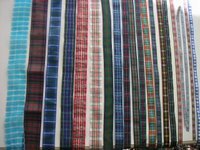 This is a man's juban. The caption said he was a wealthy trader. 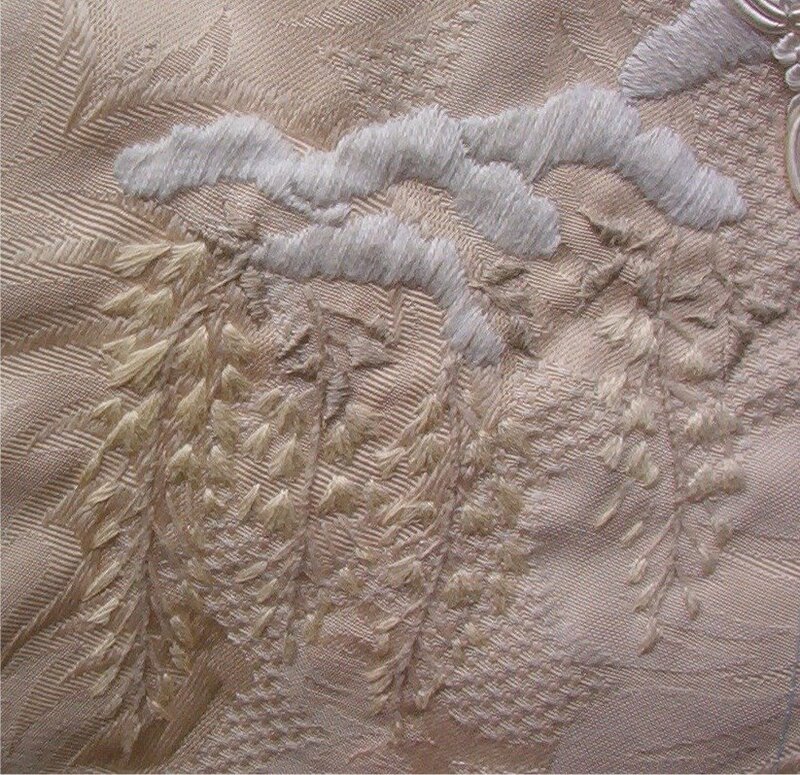 In those days chintz from western world were very expensive. This is very small. 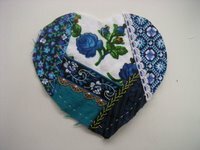 Each block is 9x9cm square. 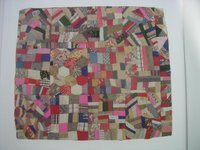 The piecing patterns are almost same as American patchwork. 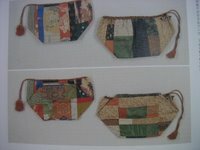 These are bags. 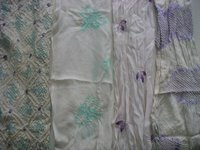 Sizes and fabrics are in variety. When the Christmas DYB started in July, I felt it was really out of season. But it's October now and I have finished three blocks. 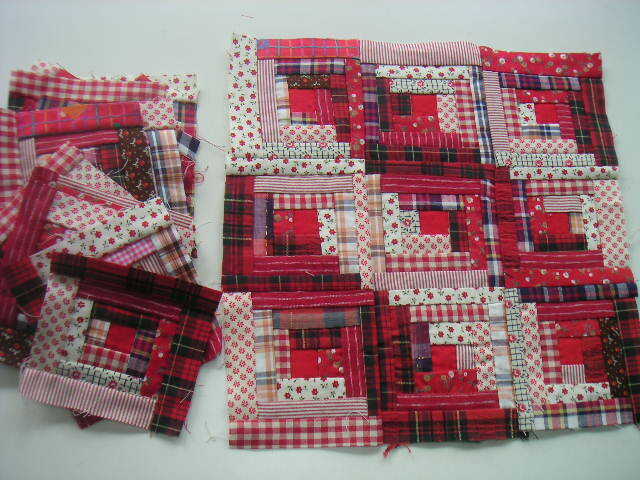 Seeing three photos together, I have realized I used plaid ribbons for each block though I was unconscious then. 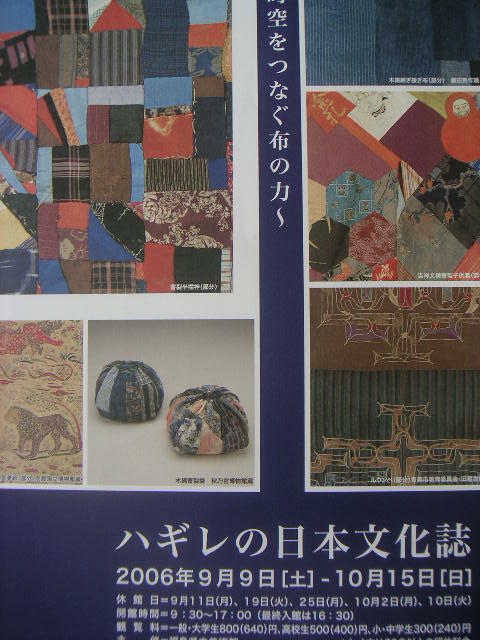 When I have no idea what to do, I open the boxes of materials which might inspire me. 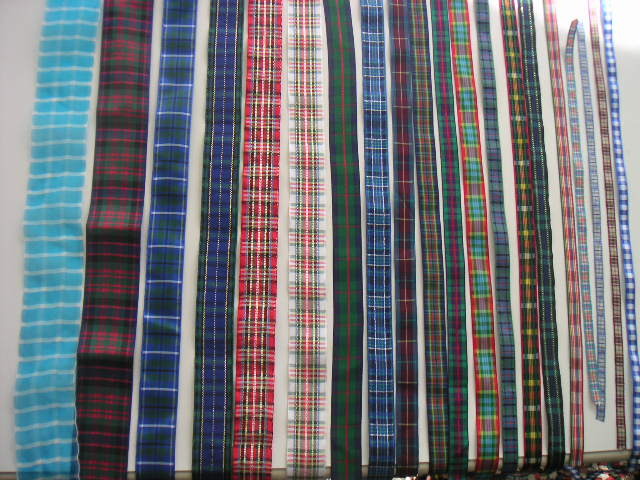 In my ribbon box, I have many different plaid ribbons with solid or organdie ones. 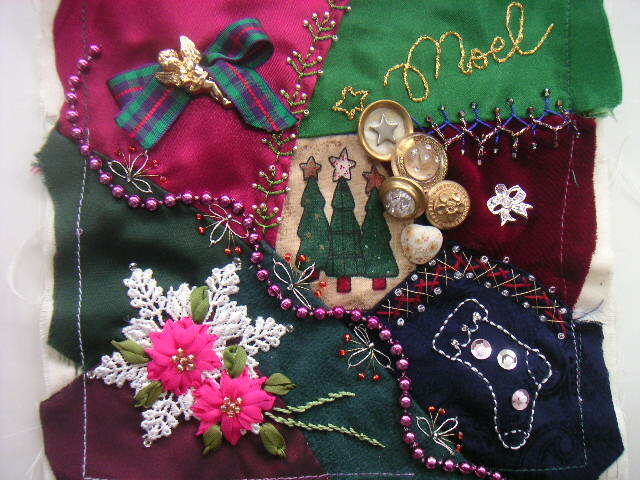 And to me they seem to suit Christmas season. In downtown we have to spend 3000yen at the least in the shop to get a free car parking ticket. 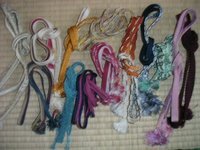 Therefore, I easily buy ribbons, buttons, laces or something small to result my collection become bigger and bigger. 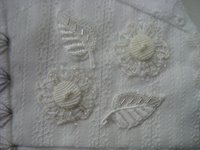 I have just finished Jakkie's block. 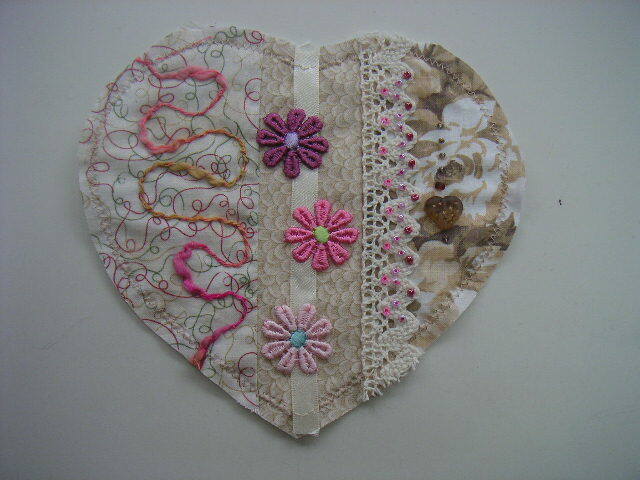 Debbie S's was the first one I did in August. 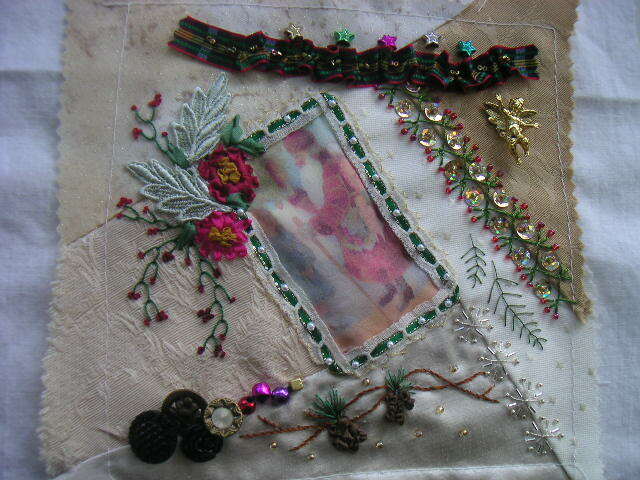 This's Debbie R's done in September. For these blocks, I didn't adopt any special technics. 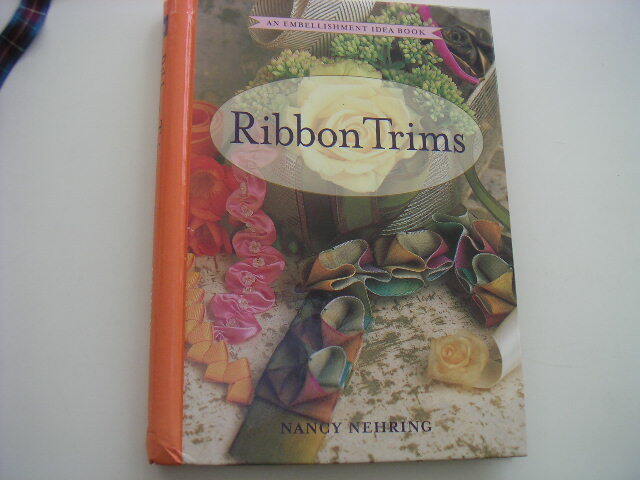 But if you are interested in nicer ways, I recommend Nancy Nehring's "Ribbon Trims". 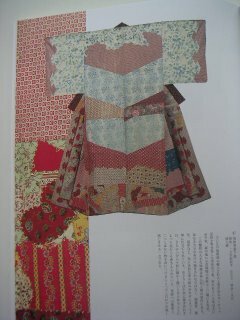 A week ago, my friend Mireille from Belgium informed me she was reading a very interesting book titled "Geisha" by Liza Dalby and found her web site. 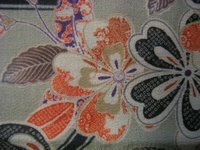 I agree it was very good site especially for foreigners to understand about Kimono, even better than my blog. 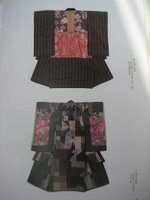 She experienced to be an actual geisha in Japan and studied about kimono. 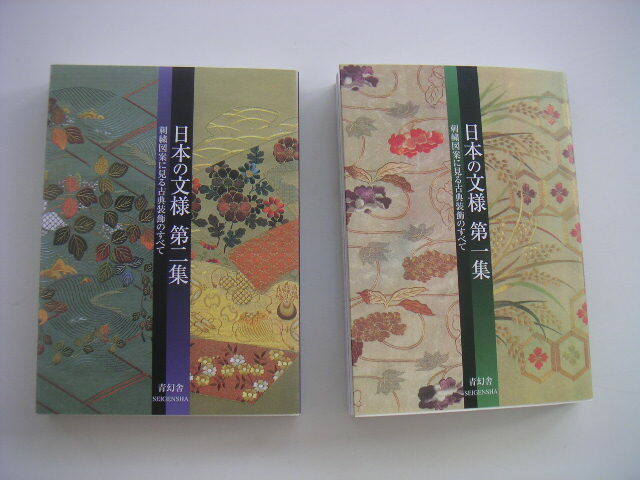 I have ordered her books to read too. I have another Belgian friend Elizabeth, who is also a very close friend with Mireille. 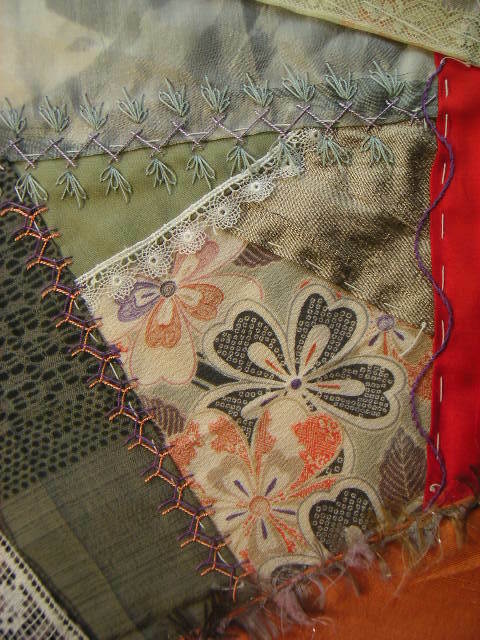 They have a stitching day a month regularly. Both love Japanese culture and have these Japanese embroidery patterns books I sent. 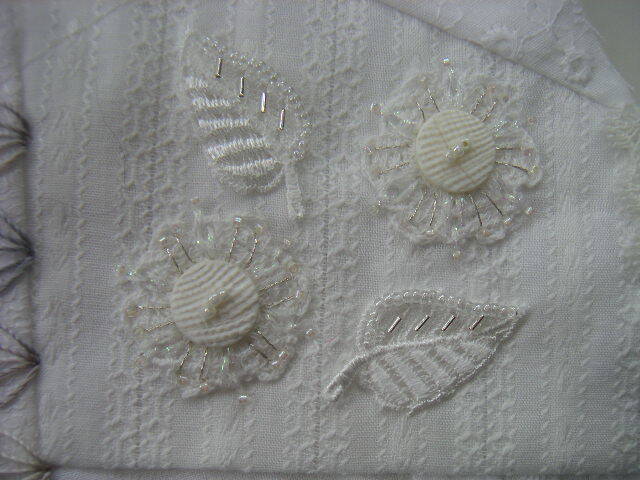 Elizabeth picked up and embroidered a pattern of wisterias and sent me the photo before the CQI group. She wondered what were above wisterias and interpret snow. What a beautiful image of "Wisteria under snow"!! 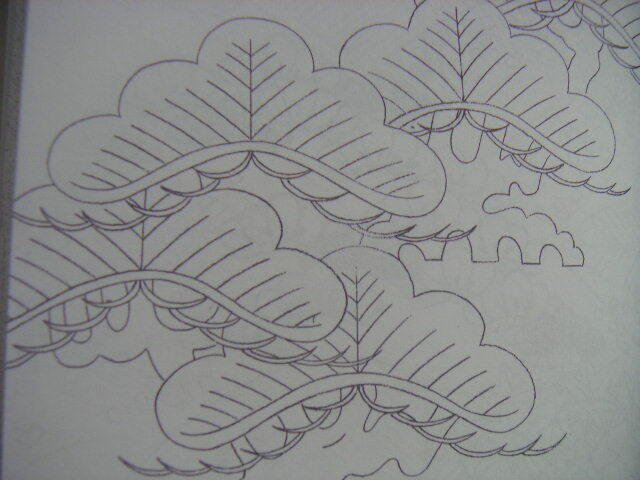 We Japanese can't imagine that because we know the shapes are pine leaves. 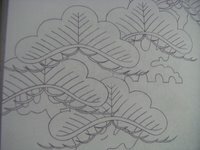 Can you see these shapes are the same as aboves? We have such kind of formula patterns. 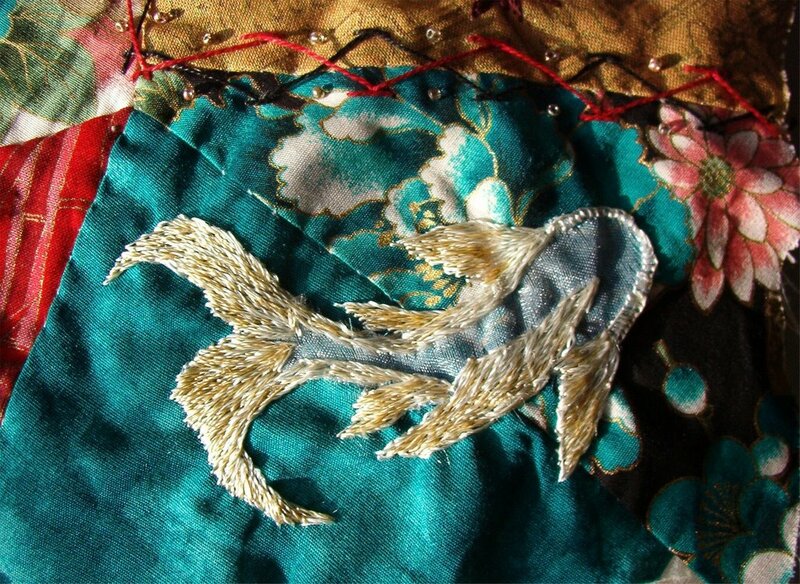 This carp is also Elizabeth's motif for a oriental RR block. She is such a excellent embroiderer. You can see lots of beautiful motifs and CQ works in her flickr albumn. She has uploaded lots of photos recently. Both Mireille and Elizabeth are too busy with their job to do group activities now. But I believe they would find time to come back to CQ again. 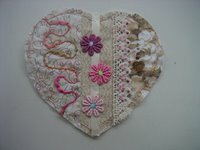 Here are many beautiful hearts I haven't show you yet. 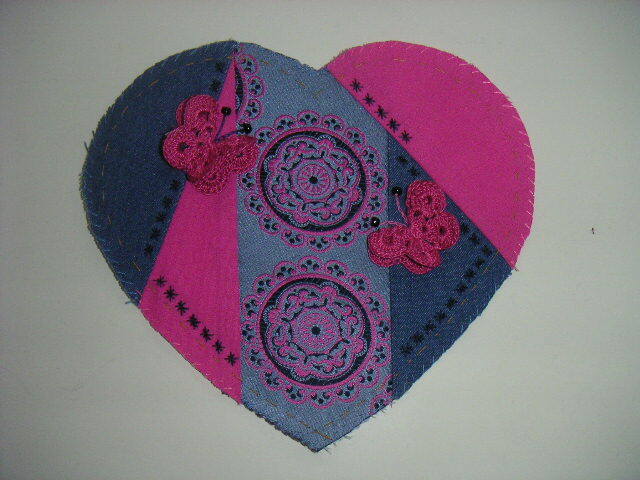 A heart by Wilma from Netherland. She has used traditional fabrics from Staphort. 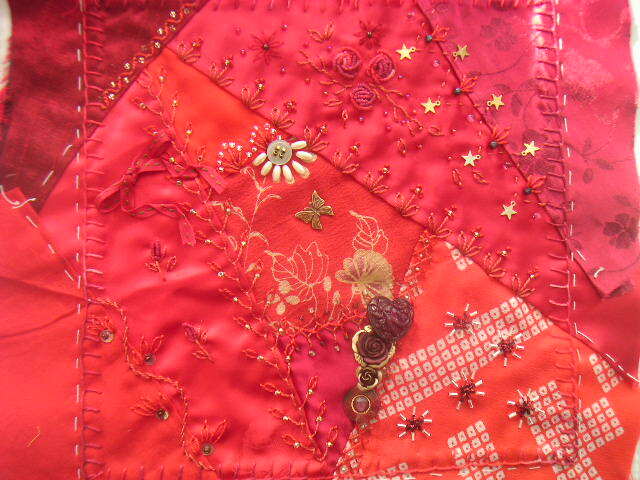 Made by Margreet from Holland, too. I love her crochet butterflies very much. A pretty heart made by Nina from Norway. 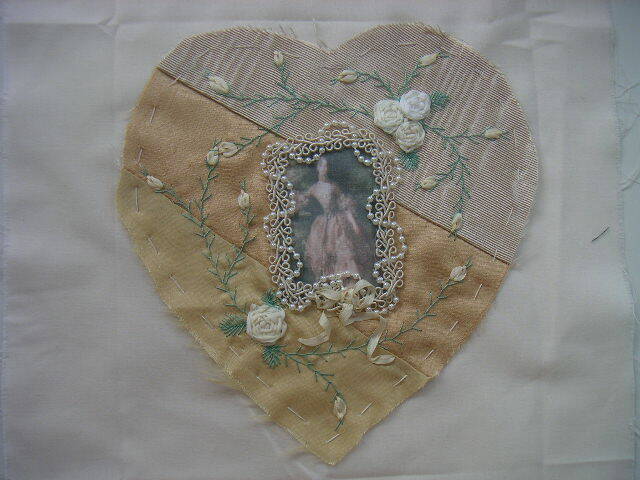 A very victorian heart from Sandie in Australia. 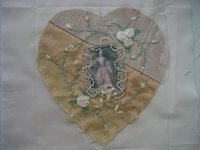 You can see other beautiful hearts and CQs in her blog. Made by Lorenza in Italy. 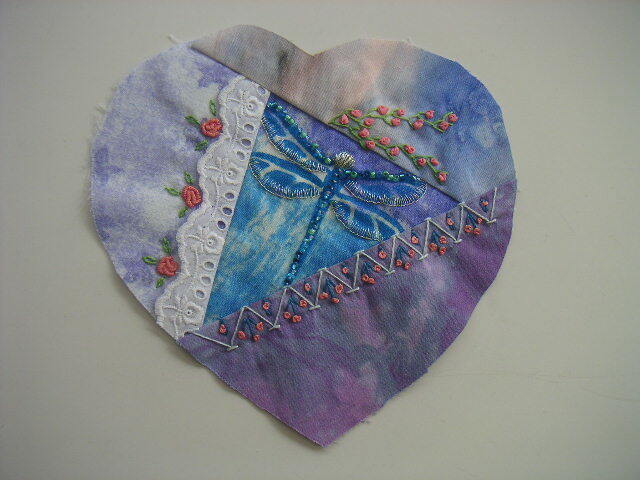 The center dragonfly is stitched with silver threads beautifully. 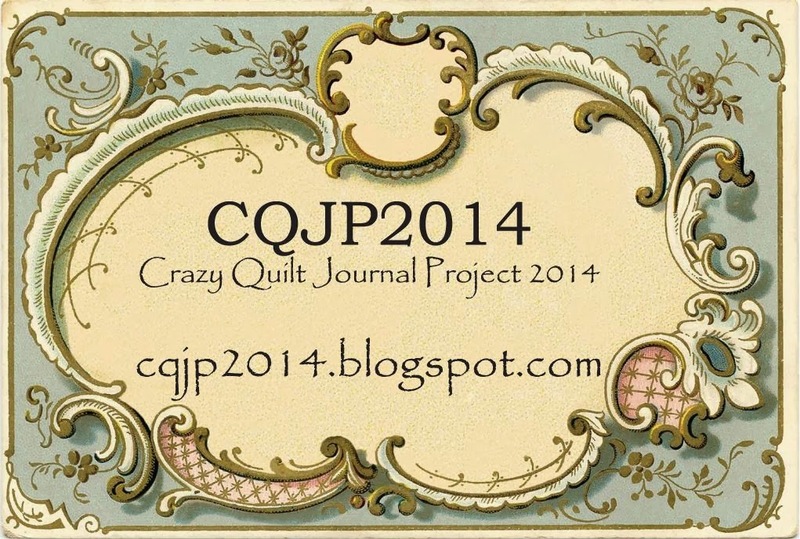 Recently I have learned the history of the COH group and Linda Barraclough started the group. To tell the truth, I joined this group long ago, but was a lurker long time. I remember her beautiful hearts in group albumn very well. Then I knew her name as an excellent Australian CQer as well as Sharon B and Annie then. I have been tagged by Jo. I have to list 5 weird thing about me or my pet and tag five others after that. 1, Jo wrote about her eyes. So do I. My right eye is very nearsighted. 0.01 or so. But therefore that eye can still read letters without reading glasses. My left eye is normalsighted, 0.7, but can't see near sight without reading glasses. However I can drive without shortsighted glasses. I have two kind of glasses, one is for shortsighted right eye and another is reading glasses for left eye, but it's so complicated and confused to use them for each right occasion, I still do everything without glasses mostly. 2, I am very bad at reading maps. When I have to drive to somewhere for the first time, I take doubled time to reach there. I prefer a fine day for driving. Because I can find the direction from the position of sun. 3, Do you know JANKEN? It's a "rock-paper-scissors". I don't know the reason why I am so weak but I have never won. 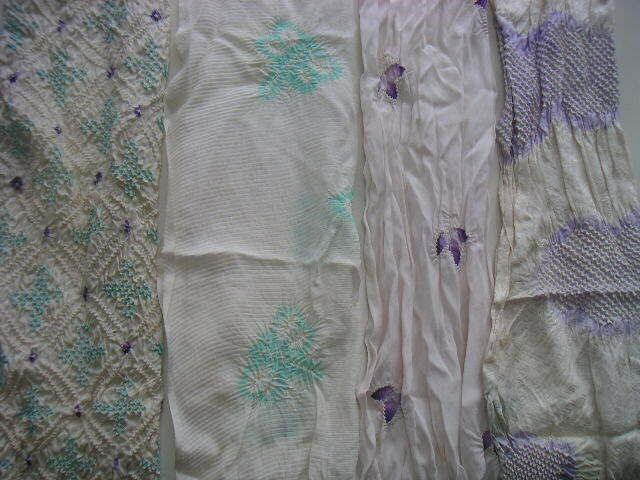 4, When I was a highschool student, my marks of home economics was very bad. So my friends of those days can't imagine I am now doing CQ. But the reason of my bad marks was I tend to be lost in group activities, for example cooking class. I could only wash dishes or weigh salt and sugar then. 5, I don't think I am a sociable type. But I am always caught in long conversation because I am a very patient listner. Are these weird things? 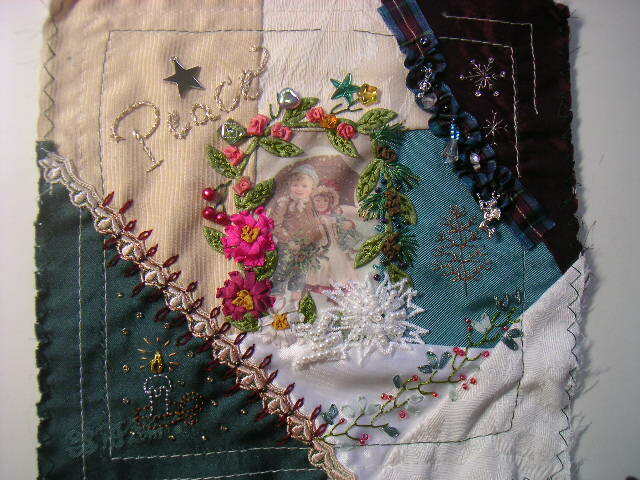 Now I would like to tag Bear, Pat, Ulla, Iris Susan, and Wilma. Last Friday evening, I suddenly felt like piecing a Christmas colors block. 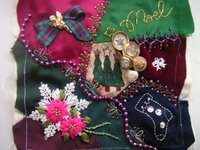 I had made my Christmas DYB blocks with glittery blue and silver fabrics but maybe from looking at Jakkie's very traditional red and green blocks I felt like that. I picked up fabrics from my plastic boxes and pieced with pins. 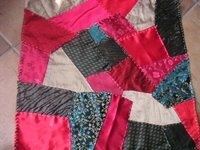 Next Saturday morning, I handsewed and finished piecing. Saturday evening my husband had his 60th birthday party his university collegues and graduates held, though earlier, for him in suburban spa. I was invited too and saw lots of familiar people. They would come to my house and drink and eat lots when they were students years ago. It was very warm and friendly party. I ate and drank lots this time because we stayed there. 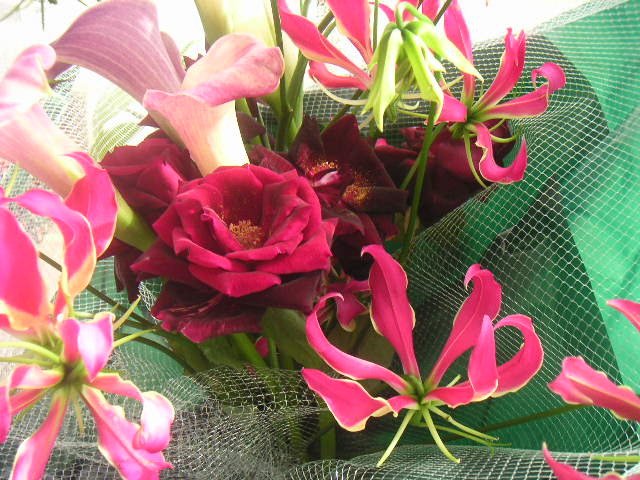 I was given a big flower bouque of glory-of-the-suns, callas and dark-red roses. 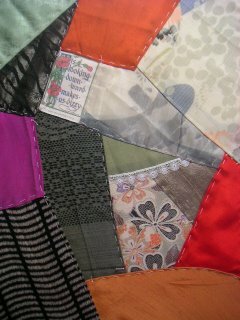 When I came home, I found the color scheme of the bouque was just the same as my block I had pieced just the day before. Was there any person who had ESP? Me? Or My husband's secretary who must have chosen the bouque?